for his oil painting on wood panel The Infinite Self. Reposted from the San Diego Museum of Art, Artists Guild site. My interest, study, and practices in art have been a life-long journey. 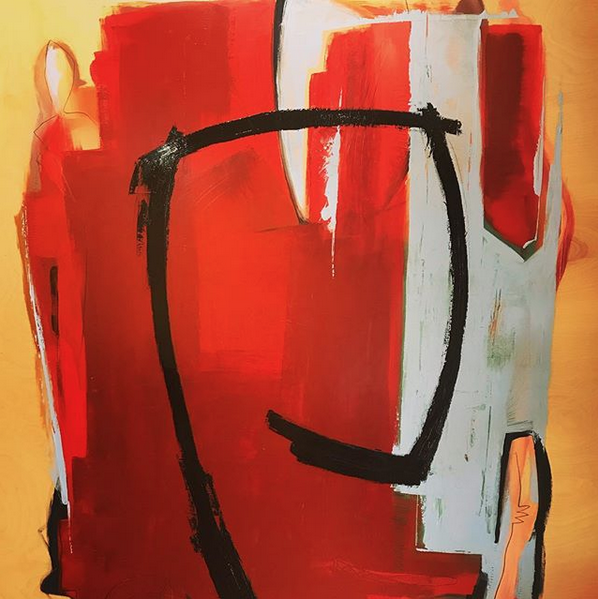 From my earliest childhood memories through my current work in the world of arts, I have found art and the artistry process to be cathartic, expressive, and connective. Art, to me and in my process, is a threshold that can move people profoundly and to connect with people in deep and meaningful ways. Done well, it should shake both the artist and the viewer from their current state of experiencing the world to a new state. It is cathartic because as I create art, I can’t help but create it as a reflection of my journey through life. While this is a personal journey it is also a universal journey, one that we’re all experiencing. Much of my artwork examines the mutuality of our humanness and the duality of our human experience, both physical and non-physical. I suppose, in its essence, my work is always exploring the universal questions of ‘who am I’ and ‘what is my place in the world.’ The cathartic foundation that is born from this exploration is ultimately about discovering ourselves and trusting ourselves. Much of my work is guided by intuition and, essentially, feeling my way through my work. While each of my pieces has an intention, beit an idea, motif, concept or feeling, at its onset, I find myself in conversation with each piece and that conversation goes into unforeseen places. One of the hardest and most essential things to do as artists is to move beyond all of our knowing and learnings—knowing the masters, knowing the craft, knowing the medium—and forge our own artistic expression. The process of both creating and experiencing art is a way of setting aside the already-forged and strategic approaches to experiencing the world and, instead intuiting or feeling your own unique way through it and with it. Here we find our own artistic voice, discover our own unique way of expressing, experience our own version of grace, and apprehend our own grand array. I believe artwork is a feeling, not a knowing, a believing or a thinking. My hope for people experiencing my art, or any art, is that they immerse themselves into it and allow themselves to be moved by it—momentarily allowing themselves to be swept away and taken by the art. Both joyous and serious art, when it works, engages a connection between the artist, the viewer and their greater common union. When I set out to create this piece, I wanted the viewer to imagine themselves as the work; inviting them to “be” the painting and immerse themselves into the strength of the central figure. This figure is intended to represent the universal “I” with a strength and confidence of presence in character. There’s an intentional heroic feel to the piece, creating a subtle reference to the common hero’s journey archetypes and myths that Carl Jung and Joseph Campbell delved into. This piece explores an iconic motif of the self-examining itself and the world around it. The brushed figure is looking out and within simultaneously. It is set on a passionate field of reds with the subtle interplay of other figures and relationships, as the figure is offset in black. The natural birch wood panel frames the painted and imagined world creating a connection between all worlds—the inner landscape, the natural world, the spiritual, mystical or unseen world, and the imagined world. While I’ve been actively painting for the past 30 years, I’ve been primarily showing and selling my work privately to collectors. The “Connections” exhibition is the first juried show I have entered my work into in the last 3 years.